By viewing this site the user is deemed to consent to all terms and conditions below. Commercial Rowing Club. reserves the right at all times to vary, change, alter, amend, add to or remove any of these terms. 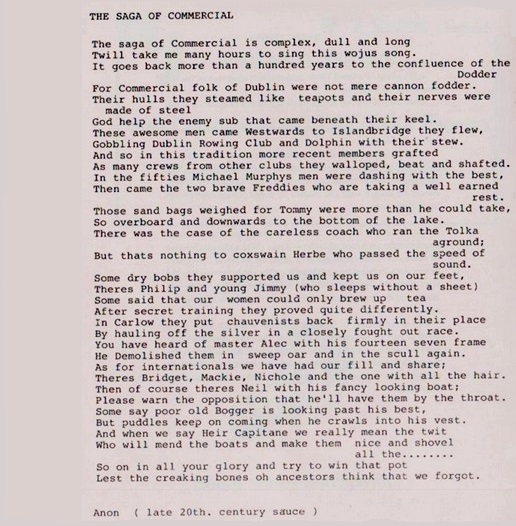 All material contained in and published on commercialrc.ie by Commercial Rowing Club and or any of our publishing partners and found or reproduced on any web site is copyright and material and is intended for the personal and non-commercial use of the user. The content of this site is protected by copyright pursuant to Irish and European Union copyright laws, international conventions and other copyright laws. The user is specifically prohibited from modifying, publishing, transmitting, selling, participating in the transfer or sale or reproducing, creating derivative works from, distributing, performing, displaying or in any way exploiting any of the materials on this site or the software or materials relating thereto in whole or in part. The user may download or copy material for personal use only but the copyright therein shall be maintained in Commercial Rowing Club. and all publishing partners. Links are not permitted other than to the Home Page, except with prior written consent. In relation to any other form of linking or use of material, users must receive prior written permission. All trademarks and logos on this site, www.commercialrc.ie, may not be used without express written permission. Commercial Rowing Club. excludes any warranty, express or implied as to the quality, accuracy, timeliness, completeness or fitness for a particular purpose of the material on commercialrc.ie and will not be liable for any claims, penalties, loss, damages or expenses arising from the use or the inability to use material on commercialrc.ie, or from any unauthorised access or alteration of same. Commercial Rowing Club makes no warranty that the contents of the commercialrc.ie website is compatible with all computer systems and browsers. Commercial Rowing Club cannot be responsible in any way for any material that you encounter. We exclude to the fullest extent permitted by law all liability that may arise with respect to or as a result of such material causing any damage, costs, injury or financial loss of any kind.